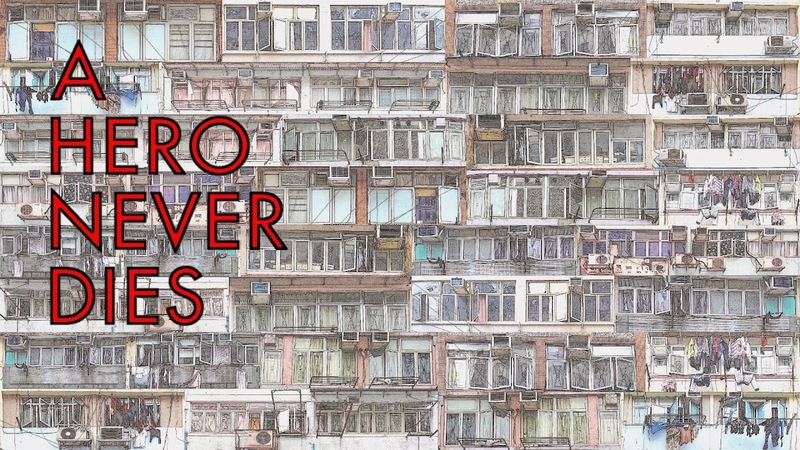 I'm not even going to attempt to unravel the lineage of Hong Kong's gambling movie history, with so many spin offs of characters and titles linked to other films and series. 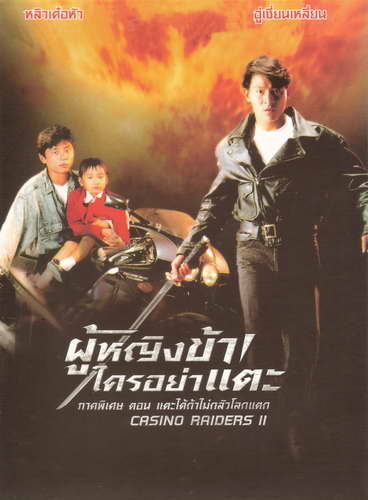 Apparently Johnnie To's Casino Raiders II has little if anything to do with Casino Raiders, this is precisely why I'm not delving into it, life's just too short. Casino Raiders II has a typically overloaded plot for this era of Hong Kong cinema, which essentially boils down to Mr James' (Kelvin Wong Siu) attempts to get hold of a piece of magical jade from Uncle Fan (Lau Siu Ming). This piece gives the holder the powers of the God of Gamblers and Mr James and his henchmen Pow (Anthony Wong) will stop at nothing to make sure he gets it. 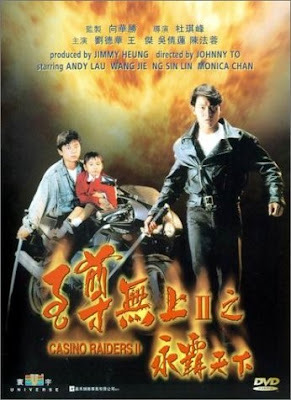 This results in a ridiculous amount of incident packed into ninety minutes (that would have been too much in a film twice as long), including pushing Uncle Fan to commit suicide, before the good guys led by Chicken Feet (Andy Lau), Lin (Wu Chien Lien) plot for revenge. Far from subtle Casino Raiders II throws as much suffering at the screen as it possibly can, some of it works and some doesn't. A few moments pack a punch but it's so relentless that it's hard to care about most of it. The film was notable at the time for reuniting Andy Lau and Wu Chien Lien from the previous years A Moment of Romance, audiences looking for the same dynamic were disappointed however. Lau's performance is similar to many of his roles around this period, it seems he was doing his level best to promote smoking here as he seemingly has a cigarette dangling from the corner of his mouth throughout most of the running time. He's fine without be stretched by the film at all. The film's best performance predictably comes from Anthony Wong, a fantastically sleazy breath of fresh/foul air to the otherwise humour free proceedings. He's also rocking a knockout moustache, something we don't see enough from him. The film looks good, courtesy of being shot by Horace Wong Wing Hang, who was one of the cinematographers on John Woo's The Killer and the film feels like it's aiming for a similar feel to those incredibly popular Woo movies of the time. It doesn't quite have the quality to achieve this level, lacking in scope, execution and in fairness budget. 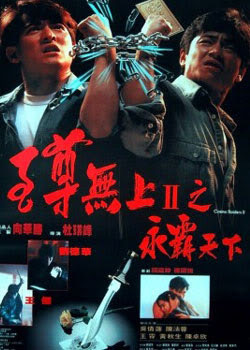 It does boast a couple of excellent action sequences, put together by Hong Kong legend Ching Siu Tung. The boat being rammed into a dock is especially impressive. An effort from Johnnie To back when he was still learning his craft and being a director for hire, nothing here really points towards what was to come from him later on in the decade, other than perhaps the darkness of tone. The plot is far too contrived and melodramatic for it to carry any real weight, and the gambling aspects are pushed so far into the background it barely counts as a gambling movie. It feels like a story that had been written and then adapted to fit the gambling genre as it was red hot at the time, and for all of the many wonders of Hong Kong cinema, this was the business side of it. It's a pretty good film, without being anything truly special and is recommended mainly to completists of To, Lau or Wong. How about the awesomely bad Dave Wong Kit? There's a pivotal scene involving Wong and a cleaver that's absolutely hilarious. I see this filmed is produced by real-life triad boss Jimmy Heung. I guess To and the actors don't really have much say in whether they want to direct or act in this movie, since Heung can be rather hard to "turn down". Dr Lamb, I did think about putting that bit in and even screen capped it, but in the end left it out so as not to spoil it. You're right though it is really funny. Anon, Thanks for the info, I wasn't aware of that. I do remember the whole uproar of the triads forcing themselves into the HK film industry and the repercussions of turning down their "offers". Also I'd love to hear more about the secret history of HK gambling movies ! There are some truly incredible stories Wes, I just daren't repeat them, you never know who's reading! As for the gambling, it's one of HK's primary pass times so the combination of it along with powers along the lines of different styles of kung fu were always going to be an easy sell, they are mostly great fun too!